Mesoamerican wheeled toys have been something of an enigma since they were first discovered by Desire Charnay in the late 19th century. At first, the discovery was met with scepticism and it wasn’t until controlled excavations at Tres Zapotes in the 1940s revealed two more wheeled figurines that their existence was considered authentic. There are around 100 known examples thus far and they vary in construction according to where they were found. Small solid-bodied examples were found around the Veracruz and northern coastal regions, whilst larger hollow-bodied examples have been found in Veracruz, Michoacan, Geurrero and El Salvador. If putting wheels on an animal wasn’t strange enough, the larger type are often flutes or whistles with the posterior or tail being used as a mouthpiece. Fig W0352 from the Museo Regional de Antropologia dates from between 300AD and 900AD and doubled as a whistleThe majority were made by threading an axle through loops formed on each leg, with one between the front legs and another between the hind legs, with a wheel mounted on each end. Another composite type does exist, with the animal mounted on a plinth through which the axles were mounted. Both types result in a fairly robust mobile animal on wheels, which most people liken to a child’s toy – although it is very unlikely that they were given to youngsters to play with. The vast majority of wheeled animals are dogs and jaguars, with less common examples including monkeys, deer, armadillos, crocodiles and iguanas. Some were mass produced using moulds, although most were made by hand. The majority of examples that exist today are thought to have been made in the Early Post Classic Era (900AD-1250AD), though some do come from the earlier Classic Era (200AD-900AD). The reason so much fuss has been made over these wheeled toys, is that until recently the wheel was believed to be symbolic of humanity’s evolution from caveman to civilisation – and to have failed to invent it was considered evidence of a primitive and technically undeveloped culture. Other inventions, such as lashing a rock to a stick to create a mallet and then sharpening the rock to create an axe, are arguably simple developments of the elementary tools required to survive and progressions which you would expect to occur over thousands of years. You wouldn’t expect that because an axe was found in France and another in America, it meant someone had travelled to America with an axe and showed people there how to make them. However, to build a wheel and fix it to a cart is a complex invention designed to provide a solution to a non-essential problem – it not only requires a far more profound mental ability, but also a culture of creativity. Archaeology has now revealed that the wheel wasn’t invented until the 4th millennium BC – which puts it thousands of years after the first cities were built and after the invention of metallurgy, and its importance in determining the intelligence of a race is no longer rational. From the 4th millennium BC, the wheel steadily spread from Europe, North Africa and the Middle East along to the Indus and China, where it first appears in the 12th century BC – very slow progress! But, the time-lapse between reaching China and Mesoamerica is far less. Officially, the wheel couldn’t have travelled from the Old World to the New World because the first trans-oceanic contact was either made by Columbus in 1492 or by Vikings in the 10th century. Therefore, the Mesoamericans must have invented it independently – and this is the enigma that these small figurines provide. Why would they invent the wheel for the sole purpose of attaching four of them pointlessly to the legs of animal figurines? No other use of the wheel has been discovered and there are theories to explain why: firstly, the terrain of Mesoamerica would make its use impractical; secondly, the lack of cart-animals would negate its value; lastly, their religious beliefs forbid them from taking advantage of a mechanical device to assist with carrying heavy objects. However, two wheeled figurines were found at Teotihuacán, where the plains surrounding the city would be perfect terrain for hand-drawn carts to help move the huge quantities of stone required to build the colossal pyramids and dozens of temple structures. Therefore, the only reason that remains for them to have not used the wheel as intended is that religious beliefs forbid them to or, to be more precise, that they believed it is the effort that yields the reward and not the result. 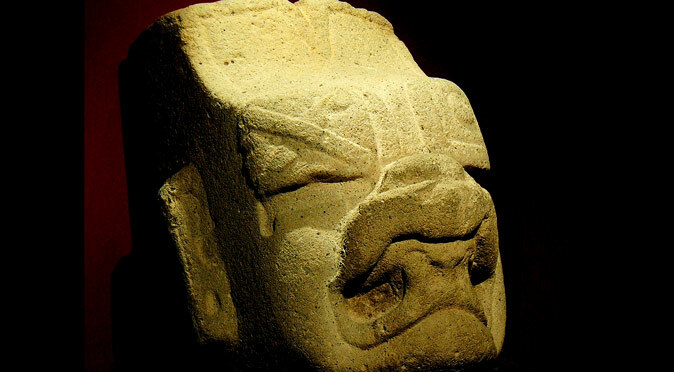 Mesoamerican culture was deeply religious and daily lives revolved around pleasing the Gods and proving your devotion and dedication with the aim of achieving a better life on earth and a better afterlife or reincarnation. Therefore, by sacrificing yourself to hard labour you would hope to be rewarded in the next life, and to use a wheel would have been considered worthless. 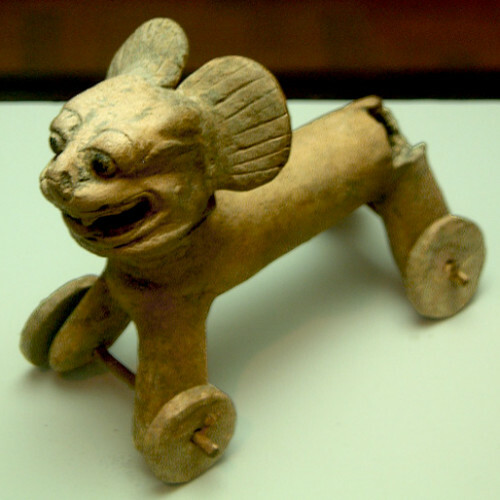 Whilst that perhaps explains why the use of the wheel was limited to small toys, it still does not explain why they invented the wheel only to use it on small animal figurines. The only perceivable reason for this is that they bore a significant religious message – such as those who use the wheel are mere animals. But, this raises the paradox of why they would invent the wheel solely to demonstrate that you shouldn’t use it. A more reasonable suggestion is that someone brought the wheel to Mesoamerica and taught people to consider its use, or its lack of use, as sacred. 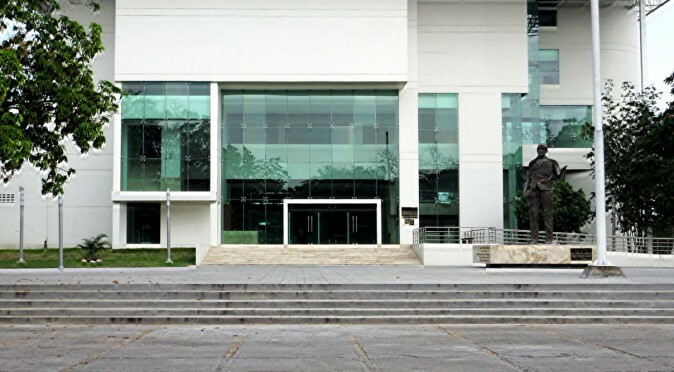 When looking around the Museo Regional de Antropologia at Villahermosa, the number of Asian looking idols certainly raises an eyebrow, and looking at Mesoamerica as a whole, in particular the imagery of dragon-like feathered serpents, it isn’t unfair to suggest that the wheel and the traditions of sacrifice came together from Asia. A sold gold Olmec wheeled toy was found and the weird thing, there was another in Cambodia during that time period that was exactly the same. I remember reading that the Spaniard that discovered the Panama area was asked by the Native chief why he was mean and torturing people, that other people in big boats came there and didn’t do that. The Spaniard said where do those boats come, and that was how the Pacific ocean was discovered.